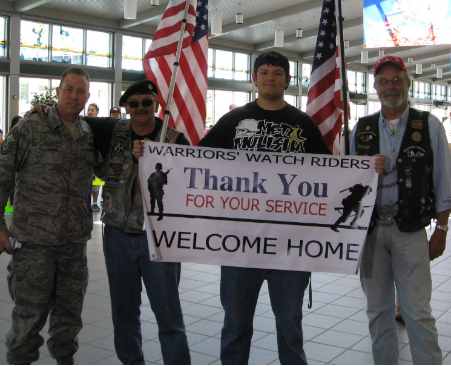 » California: Welcome Home 45th APS,USAF, Tsgt Andy Csepely Warriors' Watch Riders: WE HAVE YOUR BACKS AT HOME! Got a message from a friend Sean Poynter that part of a USAF Air Cargo unit was coming home from Afghanistan.About the same time I also got a text from one of the riders that he was coming home.Andy is his name and he rides for the WR,his unitThe Mighty Mighty 45th was on its way home.Andy wanted us to be at Sacramentoto welcome home his Unit. On the same side of things the 45th also works with a Navy Air Unit , CHB3 Air Cargo. Also part of my Battalion,I’m Ship Side. What a coincedence. So we headed up to Sacramento Airport, about 60 miles North of us. We met up with Pyro Willie and some of the Sacramento WWR as well as riders from the Local PGR. We headed over to the Airport and the Local Defenders Of Freedom as well as Red Cross,SAMS, BSM’s and family members.The Unit members were on hand as well. we waited for the flight to arrive , with all the groups. Finally the 1st of the 13 members came down the stairs.The whole place went wild with cheers and whistles.Then the rest of the Unit came down.I saw Andy as he went over to his wife,he and all his team were just so happy to be home. We gathered around as they all went to their families to meet them. 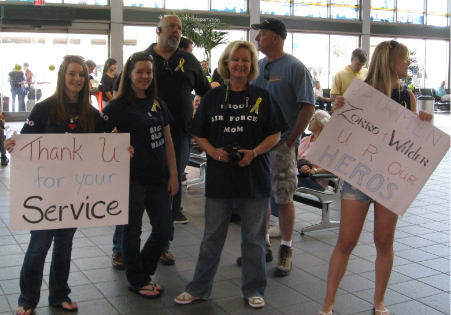 They waited for gear and then headed home in their POV.Welcome Home Mighty Mighty 45th. Some Members got into the Unit Van,which we Escorted on the Freeway to theirexit. 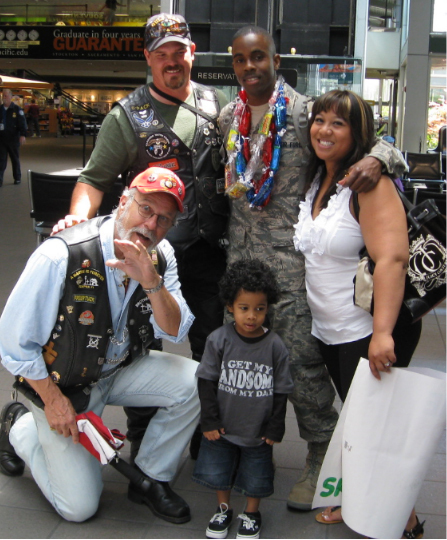 No user commented in " California: Welcome Home 45th APS,USAF, Tsgt Andy Csepely "